Martha T. Ramsey grew up on Cape Cod and is a founding partner of Ramsey & Associates, an elder law firm located in Hyannis. She’s a graduate of Hood College and has a law degree from the University of Baltimore School of Law. In 1985, she began her career with the law firm of Sykes & Cole, before opening Ramsey & Associates in 1988. Throughout her career, she has been active in organizations that serve the senior population on Cape Cod. She has served as past president of Elder Services of Cape Cod and the Islands, past director of the Massachusetts Chapter of the National Academy of Elder Law Attorneys, served for many years on the Barnstable Council on Aging, a board member of Cape Cod Human Services, clerk for the Cape Cod Foundation, a board member for the Hyannis Public Library, and an advisory committee member of the Cape Cod Alzheimer’s Association. 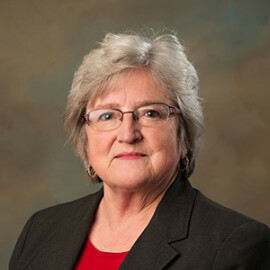 One of the Bank’s Corporators, Martha was elected to The Cooperative Bank of Cape Cod’s Board of Directors in 1989, where she is a member of the Community Reinvestment Act (CRA) Committee and the Audit Committee. Presented with the Outstanding Chapter Member of the Year award by the Massachusetts Chapter of the National Academy of Elder Law Attorneys (NAELA) in 2000, Martha has two daughters and currently lives in Hyannis with her husband.